A £43,000 project to commemorate a historic Knaresborough ‘icon’ has come to fruition as the committee gets ready to reveal a new town centre statue. The final work on a bronze seated sculpture of Mother Shipton is now being undertaken, ahead of the big reveal on Saturday, September 30. The statue, which has been backed by various organisations and businesses across the county, will sit next to the seated sculpture of Blind Jack in Knaresborough’s Market Square. Coun David Goode, Mayor of Knaresborough, said: “In my mind there are now three icons that bring meaning and reinforce the history of the town - Blind Jack, Mother Shipton and St Robert. “Mother Shipton is an icon for the town and clearly it has meant a lot to the residents over many many generations to have that link. “The Blind Jack statue creates a great focal point within the Market Square and Mother Shipton can only add to that. “You only have to visit the Market Square to see the number of people that use it to sit and have a rest or take a picture, it all adds to people’s enjoyment. “Mother Shipton both in terms of the history of the town and in terms of it’s prominence as a tourist destination is key to the prominence of the town today and its future success as a tourist destination. Coun Goode also praised the work of the Mother Shipton Appeal committee, chaired by Knaresborough Town Councillor, John Batt. The project to raise funds for a seated sculpture of Mother Shipton was first launched in 2013 with a fundraising target of £40,000. 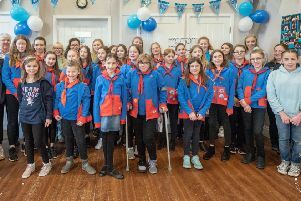 However, the target was later raised slightly to £43,000, and started to take off when Marketing Officer for the committee, Michael Owen, took over the role of sourcing donors and supporters, in 2015. Mr Owen said: “Our Harrogate based sculptor, Chris Kelly, is now at the foundry in Wales completing the bronze statue. “We believe that this is something Knaresborough, Harrogate and all of North Yorkshire can be proud of. Knaresborough Silver Band have been booked to perform at the unveiling on September 30, which will take place at 12pm with the Mayor of Harrogate, Councillor Anne Jones. The statue will be unveiled by Angela L James, daughter of George A Moore from the George A Moore Foundation - a major donor to the project - before a reception for guests and sponsors at the Church on Gracious Street.